A major tenet of existentialism is we create our lives through our values, choices, and actions. Certainly, no one would say this is an “easy” task during any time period. European Existentialists of the 1940s and 1950s, such as Sartre, de Beauvoir, Camus, and Frankl, formed their philosophies with World War II as a backdrop—when choices presented life and death consequences that most of us who live in the United States do not face today. While people I know may face a generalized “existential angst,” dread, or anxiety that can impact their psychological well-being, it does not threaten their very existence. Thus, when I travel to a country that has experienced extreme hardship and political violence in relatively “recent” times, I realize how blessed I am and often return with a feeling of awe—human beings can create their own destinies despite severe limitations and develop into caring individuals who want to help others do the same. A recent trip my husband and I took to Cambodia, and the story of Sim Piseth, our travel guide, reminded us of our blessings and what individuals can achieve in spite of severe and significant challenges. Sim was born just after the Cambodian revolution, which will always be part of his family’s history. His father was married and had four children by his first wife who was killed by members of the Khmer Rouge regime for digging up and eating a potato she had planted. Sim’s father remarried and had five other children including Sim. Thus, he was a member of a very large family. 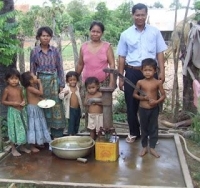 Sim grew up in the village of Sophy, about 13 miles from the city of Siem Reap. Sim finished primary school in his village, but his family did not have the money to send him to secondary school. Because he was smart and a hard worker, his parents sent him to a monastery where he became a monk and lived for eight years in order to complete his education. As a child, Sim dreamed of becoming a professional, symbolized by wearing a suit and tie. He held up the tour-guide identification he wore around his neck and said he never imagined wearing a “tie” would take this form. When Sim was 16, he met a German who advised him to improve his English so he could qualify for a job in tourism when Cambodia achieved political stability. At the time, there was no tourism in Cambodia as there still was war between government troops and Khmer Rouge guerrilla fighters. Ultimately, as tourism started to develop, Sim decided to leave the monastery so he could support himself and his family. Sim got a job as an English teacher and started working his way up from low-paying jobs as a waiter in a small restaurants and hotels to better-paid jobs as a tour guide. Sim continually referred to his achievements as “luck”—as when he was advised to learn different languages (he now speaks five) so he could direct more tours for tourists from other countries who travel to Cambodia at different times of the year due to their vacation schedules. I pointed out to Sim that “luck” can be defined as “where preparation meets opportunity” (a quote attributed to the first-century Roman philosopher Seneca and recently shortened by Oprah). Every time someone suggested there might be a future opportunity, Sim made sure he did the hard work required to benefit from the opportunity, should it appear. In addition to supporting his parents and family, Sim invests in the future of his country. Because he believes every child in Cambodia has the right to an education, Sim founded Homestay Volunteer Teachers Organization (HVTO), a non-profit NGO that develops and manages projects of free education programs aimed to improve the quality of life for poor Cambodian communities. As a tour guide, Sim meets tourists who want to help Cambodian communities and coordinates efforts to visit and support orphanages, enroll children to go to school, build schools in rural areas, and bring water pumps to villagers. As a little girl of about 10 years old rode her bike past our bus, Sim reported a recent project had been to buy 10 bikes so village children could ride bikes rather than walk six miles to school. Sim told us that in Cambodia a bike costs about $55.00. I will remember our trip to Cambodia for many reasons—the beauty of the sunrise on Angkor Wat, the temples we visited, and the indomitable spirit of the Cambodian people. But most of all, I will remember the inspirational story of our guide, Sim Piseth. Traveling to Cambodia and meeting Sim was a reminder that creating meaning for one’s life is not just “luck” —it is acting on your values to create an authentic life. My definition of an “existential hero” is one who not only creates a meaningful and authentic life, but does his or her best to enable others have an opportunity to do the same! To learn more about Sim Piseth, Homestay Volunteer Teachers Organization (HVTO), or to contribute to HVTO, visit their website at www.hvto.org.